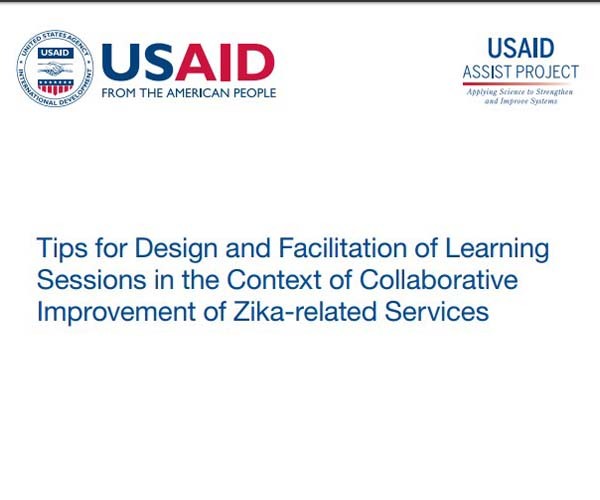 This guide, available in both English and Spanish, was prepared to support country teams of the USAID Applying Science to Strengthen and Improve Systems (ASSIST) Project in designing and conducting effective learning sessions as part of quality improvement collaboratives for Zika-related health services. In the context of ASSIST’s facility-based Zika services improvement program, learning sessions are an important knowledge management strategy for gathering and integrating learning from the work of improvement teams about how to improve specific areas of Zika prevention, care, and support. Shared learning allows all teams in a collaborative to benefit from the knowledge of both successful and unsuccessful change ideas tested by any team. The guide first describes what learning sessions are and their purpose within collaborative improvement methodology to promote experience sharing and integration of learning. It also presents options and considerations in designing a learning session and is followed by a section with tips for convening and facilitating learning sessions, including planning for what happens after the learning session.